Albert Burgess a retired police officer from Britain explains the Treason taking place in his country and the failure of Police to investigate and lay charges against those involved. Regardless of where you live or your political affiliation, this video will wake you up. The free world is at the crossroads. We have only two choices at this juncture. Live free, which is going to take considerable effort by all, or, live under Tyrannical rule by a group of unelected Godless Elite. Make your choice, but make it soon. 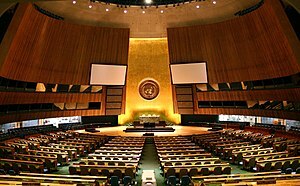 The United Nations goal, since inception, is One World Govt. The media, controlled by those pushing One World Govt. The Politicians, controlled by those pushing One World Govt. The Churches, controlled by those pushing One World Govt. The Schools, controlled by those pushing One World Govt. The Global threat is not MMGW or climate change. The Global threat is One World Govt. via the United Nations. Only if “we” allow it. The future of the world and civilization rests in each of our hands. So, forget the politicians and the clergy, they sold their souls a long time ago. This is up to us, and only us. Yes, we have the power to win. The question is, do we have the will? We are on our own folks………..it’s time to step forward! The Municipal elections are just around the corner. Put your hundred dollars on the table and jump in. It’s just like going for a swim. The water’s great once you get in. So, dive on in. Your opportunity to educate the public and make a ‘real difference’ in your Municipality……………..awaits. Please pass on to others both in Canada and America. It’s show time!………….or Jackboot on your face forever time! Fighting wind farms? – forget the health issues and start speaking the “truth”. Wind farms are a fraud sold to the public as a way to cut C02 emissions to fight the MMGW fraud. Asking for a health study is akin to accepting the fraud. “It is just because we are really attacking the principle of local sovereignty that we keep on protesting our loyalty to it so loudly. The harder we press our attack upon the idol, the more pains we take to keep its priests and devotees in a fool’s paradise – lapped in a false sense of security which will inhibit them from taking up arms in their idol’s defense…. Canada is ripe for a divine chastisement. Trudeau’s choice is the proof. God’s wrath is going to strike hard and we will deserve it. The Prince of Lies will reign supreme – J. Maurice LaPlante, 5 April 1968. It’s sad to see people like Maude Barlow sell out her country. You left a comment on my blog about a year and a half ago – shortly after i first sarted it – your comment below for reference. but something happened last christmas that really made me stop and think. i’m not sure exactly what it was (possibly discovering Immortal technique) but somthing clicked and i could no longer go back to my previous life. I immersed my self in researching the lies and conspiracies being perpetrated upon us and my world became chaos, and this is where i’ve been for the last year. It has not been a pleasant journey but i believe it was necessary. then a few months ago whilst following the tedious links, i stumbled back upon your blog and smiled. I just wanted to write you this letter to thank you for playing your part in helping me become who i am today. when i look back at my original plan for the Carrot Cake Education i realise how misdirected it was but at the same the i realise the core ideology is in the right place – to tackle problems at the root rather than simply alleviate the symptoms. Only now i feel better informed about the real problems we need to be addressing. – at first it was a scary prospect, going up against such a powerful web of control engrained within the society we’ve helped build but then i realised how easy it is to bring this house of cards tumbling down – because it’s all built upon our shoulders, we support it and allow it to continue controlling our lives, and it all stops, whenever we want it to – when we make a stand together and just say ‘no’. July 8, 2008 at 2:00 am Hi! you made some good points. But you missed the main point. This is not about the environment. If it was, you would be getting your free trees. You would be getting large rebates to upgrade your home to make it more energy efficient. Your tax dollars at work. This is about big business and control, not the environment. The environment is being used as a vehicle to forward their agenda. It keeps your mind off the real objective. Please read Global Green Agenda found under Agenda 21 on my blog. Also read Cloak of Green also found on my blog. I’m just trying to help you understand. Posted in Agenda 21, Al Gore, Bilderberg, Christianity, climate change, David Suzuki, David Suzuki Foundation, Global Warming, global warming fraud, skeptics, truth about global warming, truth about wind farms, United Nations. At the two minute mark of the video below, from Australia, we learn that China is building 500 coal plants over the next ten years — One new power plant every four days. We are going to close four coal plants at the same time China builds one every four days. In the USA Obama said he will bankrupt the coal plants.